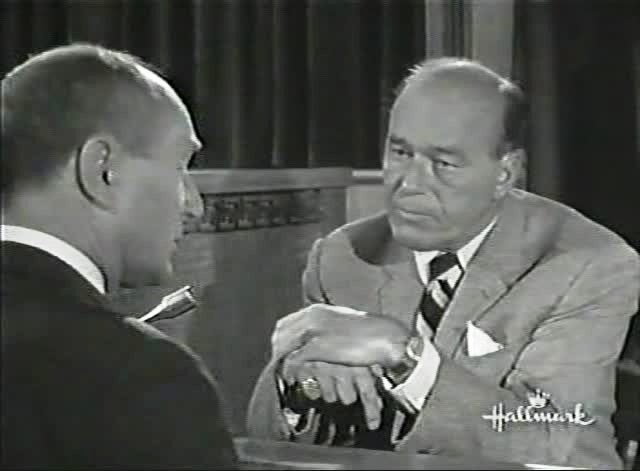 Henry Slesar's first teleplay for The Alfred Hitchcock Hour was "I Saw the Whole Thing" which, according to the title card, was based on a story by Henry Cecil. Henry Cecil was the pen name of Henry Cecil Leon (1902-1976), a wonderful English writer who became a lawyer in 1923 and a judge in 1949. His first book, Full Circle, was published in 1948 and is a collection of short stories, many with legal themes, linked by a framework involving a law professor who falls and hits his head at the beginning and who then finds himself compelled to tell stories in place of his usual classroom lectures. 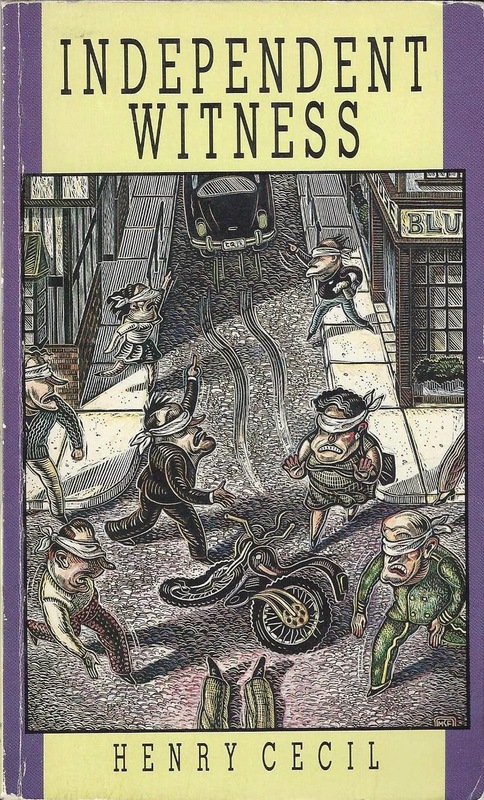 Cecil went on the write 24 novels, two more short story collections, and seven books of non-fiction, including an autobiography, Just Within the Law (1975). 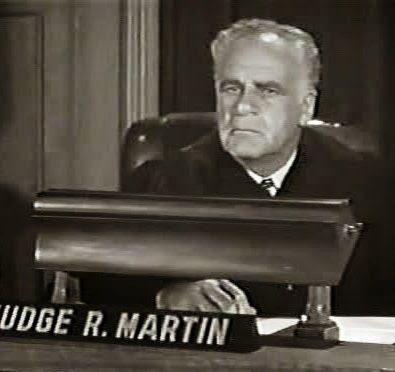 One of his novels was No Bail for the Judge (1952), which Alfred Hitchcock was preparing to film in early 1959. The movie was to star Audrey Hepburn, Laurence Harvey and John Williams, but Hepburn read the script and backed out, allegedly due to a scene where her character almost gets raped. This scene was not in the novel but was added by Hitchcock and his screenwriter. In 1958, several years after No Bail for the Judge was published, Henry Cecil wrote a synopsis for a radio play titled "Points of View," which he revised and retitled "Independent Witness." The play was dramatized on BBC Radio on October 2, 1958, but any recording of the broadcast was most likely later erased and has been lost. When Hitchcock and his producer were looking for stories to adapt for The Alfred Hitchcock Hour, one of the writers they turned to was Henry Cecil, whom Norman Lloyd called one of Hitchcock's favorite authors. Around the same time, Cecil adapted his own radio play into a novel of the same title, and Independent Witness was published in 1963. It is not known whether Henry Slesar was working from the script for the radio play that had been broadcast in 1958 or from the novel that would be published in 1963 when he adapted the story for television under the new title, "I Saw the Whole Thing." The title card on the episode provides no clue, since it states that the teleplay was "based on a story by Henry Cecil." The Alfred Hitchcock Presents Companion is incorrect when it states that the teleplay was based on a story of the same title; no such story exists. Cecil's novel, Independent Witness, is a delightfully comic tale of courtroom drama that demonstrates how many people can all tell the same story but it can still be wrong. The novel's opening line is important: "The car stopped at the 'halt' sign and the driver looked right, left and right again. There was nothing in sight . . ." As readers, we gloss over this line, yet it is the event upon which the entire novel is based. The car pulls out into the intersection and is hit by a speeding motorcycle, whose rider flies over the car and is injured. The car speeds off. Soon, over 20 witnesses turn up at the police station, claiming to have "seen the whole thing." A journalist named Andrew Mortlake visits his friend Michael Barnes, a Member of Parliament whose wife is in the hospital, soon to have a baby. Barnes tells Mortlake that he was the driver of the car and that he wants to keep the news from his wife Sheila, to avoid upsetting her and endangering her health. Barnes goes to the police station and gives a voluntary statement confessing to having been the driver of the car. He is charged with three offenses and hires Olliphant, a brilliant lawyer who has had good success with cases of this type. Olliphant outlines his plan to question the witnesses and show that they can't be sure of their stories. Fortunately, the motorcyclist is recovering well. After an initial hearing and some trickery by Andrew that keeps a particular judge from presiding over the case, the trial begins, and Olliphant pokes holes in the credibility of Mrs. Benson, the first witness, an 82-year-old woman determined to regain her own driver's license after having lost it not long ago. The second witness is Colonel Brain, whose "verbal antics" infuriate everyone and who is shown to have been in the Blue Goose pub at the time of the accident. He is followed by Commander Parkhurst, an old sailor with a wooden leg who testifies that he had been walking and talking with his son at the time of the accident. After some careful questioning, he admits that "'My son lives here,'--he tapped his head. 'Or rather, here' and he put his hand on his heart.'" Parkhurst's son, it turns out, had been killed by a sports car when he was just three years old. The next witness is Patricia Gaye, an attractive 23-year-old woman who was waiting for a young man and thinks she saw the car but can't be sure. Two more witnesses are unable to say what happened, but a witness named Mr. Berryman states that he is certain he saw Barnes's car fail to stop at the "halt" sign. After testimony by Mr. Piper, who has an odd way of speaking and adds "a-" before random words, a woman named Joan Anderson takes the stand. She surprises the courtroom by stating that the car did stop at the "halt" sign, but Andover, the Queen's Counsel, elicits that she was on the way to give up her baby for adoption at the time of the accident. The event delayed her and led to a change of heart. It is suggested that she has changed her testimony because she credits Barnes with setting in motion the events that altered her life for the better. After a final witness fails to survive Olliphant's clever cross-examination, Barnes tells Olliphant that he refuses to testify on his own behalf. The lawyers make their closing speeches and Olliphant claims that he did not need to put on a case because the case against his client was so weak. The judge agrees with Olliphant in his summation to the jury and Barnes is found not guilty. Later, in a taxi, Andrew confronts Barnes and tells the man that he has deduced that Barnes was not in the car at all--his wife Sheila had been the driver. Michael confesses the truth as the novel comes to a close. Henry Slesar had quite a challenge before him when he set out to adapt this very British novel with many characters into a one-hour teleplay. He accomplished this by making several significant changes and condensing characters and events to streamline the narrative. The TV show starts shortly before the accident as a pretty young woman named Penny stands on a street corner. A young man named Freddy stops to speak to her, but she makes it clear that she is not interested in him and is waiting for someone else. She gives Freddy the brushoff and we hear screeching brakes. The woman's eyes widen and the camera freezes on her face. We then see four more people as they witness the accident: a man spraying flowers in his garden turns at the sound and freezes; a wino outside Harry's Tavern turns at the sound and freezes; a driver approaches in his car and freezes; a woman at a bus stop freezes. 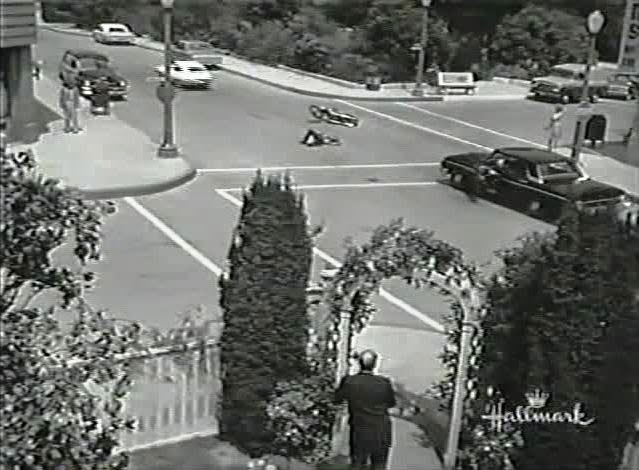 The end of the accident is then shown, as a man falls to the pavement and a sports car speeds off, leaving the man lying in the street near a motorcycle. In this opening sequence, Slesar chooses not to show the car stopping at the stop sign, leaving the viewer uncertain as to exactly what occurred. We are shown the immediate events right before the accident involving five witnesses and then the camera freezes on their faces as each hears the brakes screech and sees the event. In the next scene, Michael Barnes enters the police station and makes his statement. In the novel, Barnes is a politician; in the TV show, he is an author who writes crime stories. Lt. Sweet, the policeman who takes his statement, remarks: "I never read 'em myself--cops are always too dumb." Back at home, Barnes is visited by Jerry O'Hara, who represents Andrew Mortlake in the novel. Barnes tells Jerry that five witnesses will say that he did not stop at the stop sign but that it is not true. Barnes also announces that he will act as his own attorney. Slesar thus cuts through much of the legal red tape in the novel by eliminating the character of Olliphant and by having Barnes defend himself in court. The more than 20 witnesses mentioned in the book are pared down to five and we see next to nothing of their lives outside the courtroom, with the important exception of Penny, who is the focus of key scenes at the beginning and at the end of the show. The trial begins with the prosecutor's opening statement, which is interrupted by news of the death of the motorcyclist. Again, Slesar has changed the story; presumably, by having the accident victim die, the stakes of the trial are increased. In the novel, Michael Barnes is a public figure whose trial is front-page news; on TV, he is a writer whose future is jeopardized by the death of the accident victim. The first witness at trial is Penny Sanford, the pretty young woman who was standing on the corner in the show's first scene. Like Olliphant in the book, Barnes cross-examines her on what she was thinking about right before the accident occurred and suggests that she did not see the car until she heard the brakes screech. The young man for whom she was waiting was George Peabody, who will figure prominently in the episode's conclusion. Penny corresponds to Patricia Gaye in Cecil's novel. Witness number two is Colonel John Hoey, who walks with a limp and uses a cane because he lost a leg at Corregidor. He was the man spraying flowers at the time of the accident and his manner is brusque, officious, and temperamental. He is prejudiced against sports cars and finally admits that his three-year-old son was killed by such a vehicle. His character is a synthesis of the argumentative Colonel Brain from the novel and the wistful Commander Parkhurst, who lost both a leg and a child. Malcolm Stuart is the third witness, very sure of his story and unflappable. He was the driver of the car who saw the accident at the start of the show and he matches Mr. Berryman in the novel. The fourth witness is Mr. Peterson, a humorous character who appears to be inebriated in court. He corresponds to Mr. Piper in the novel. Finally, the fifth and last witness is Joanne Dowling, who matches Joan Anderson in the book. Both women state that the car did stop at the stop sign and then talk about their change of heart regarding giving up a baby for adoption. Slesar does a great job of eliminating events and characters from the novel to strip the story down to its essentials. The TV show then takes a couple of surprising turns that deviate from the book. First, Michael Barnes takes the stand on his own behalf, which he refused to do in the novel. He makes a brief statement to the jury and declares his own innocence, then refuses to answer a simple question from the prosecutor and seemingly torpedoes his own defense. The next scene is completely new, and is unintentionally funny. Penny, the pretty young woman from the street corner, is at a teenage dance party where everyone is doing the twist. She meets George Peabody, the young man she thinks stood her up at the time of the accident. He tells her that he saw her speaking with Freddy and consequently did not approach her. He also tells her that he saw the accident and is certain that Barnes's car stopped at the stop sign. He explains that no one asked him for a statement, so he did not come forward. She insists that he must tell someone what he saw. The scene is humorous because the actress, Evans Evans, is 26 years old and looks too old to be dancing with teenagers, though--to be fair--the rest of the teens also look long in the tooth. The other funny thing is this scene is the dancing, especially some extreme gyrations by a young man in the background. The next thing we see is the jury returning a verdict of not guilty. In the show's final scene, Barnes and Jerry walk through a hospital corridor to see his new baby. Jerry mentions that George Peabody's statement saved the day for Barnes and Barnes tells Jerry that he could not answer the prosecutor's question because he did not want to commit perjury. His wife was the driver and he was not even in the car. Why did Slesar put Barnes on the stand only to have him refuse to testify? Perhaps he thought the trial needed more excitement, since the cross-examination of the witnesses appeared to make the "not guilty" verdict a foregone conclusion. It may be that putting Barnes in this dangerous situation required the addition of the dance party scene with the surprise witness. In any case, having short scenes with Penny at both the start and end of the episode serves as a nice frame. Henry Cecil's novel, Independent Witness, is an entertaining story of British courtroom drama laced with humor, where there is never any real doubt that Barnes will be acquitted. Henry Slesar's teleplay, "I Saw the Whole Thing," injects some suspense into the narrative, streamlining the story while maintaining its humor. The two versions of the same tale are entertaining in different ways. Alfred Hitchcock directed "I Saw the Whole Thing," the only episode of The Alfred Hitchcock Hour that he would direct himself. Camera placement is perfect throughout the show, with the most appropriate angle always chosen. The opening sequence with the five short scenes ending in freeze frames is a bit showy, but a more interesting shot comes near the end, in the courtroom. 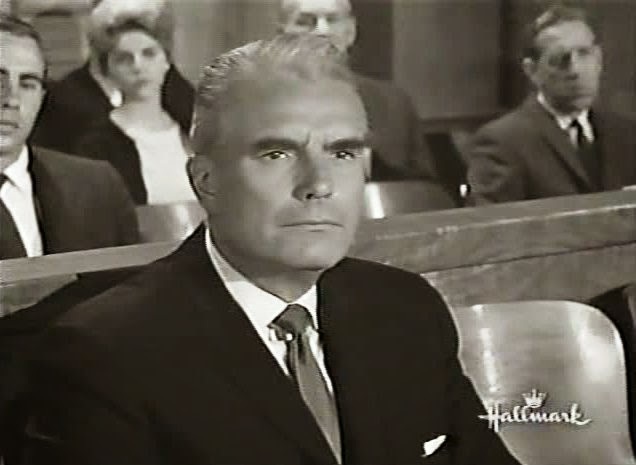 As the jury foreman's voice is heard announcing the verdict, the camera starts on Michael Barnes and then tracks left across the spectators in the courtroom, passing quickly over the faces of each of the five witnesses and all of the jurors before coming to a rest on the face of the foreman as he pronounces Barnes not guilty. It is a subtle, brief shot but it summarizes the entire show in a single camera movement. "I Saw the Whole Thing" was filed from July 23 to July 27, 1962, and it was first broadcast on CBS on October 11, 1962. Hitchcock later told Peter Bogdanovich that it was "the toughest to do of all the TV films" because of the limited set and the five-day shooting schedule. 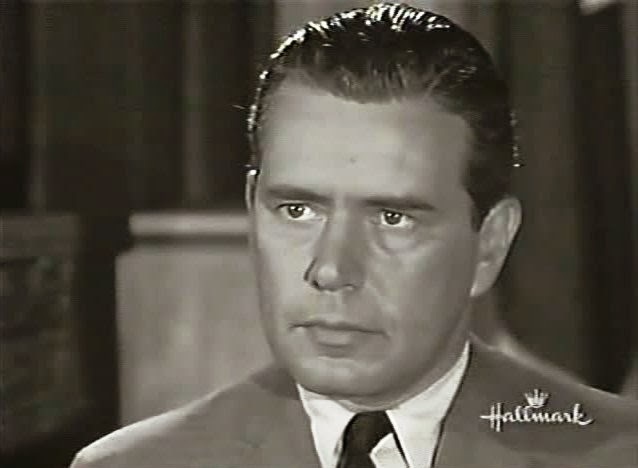 Starring as Michael Barnes was John Forsythe (1918-2010), who had also starred in "Premonition," the second episode of Alfred Hitchcock Presents to air, almost exactly seven years before, on October 9, 1955. "I Saw the Whole Thing" was his second and last appearance on the Hitchcock series. 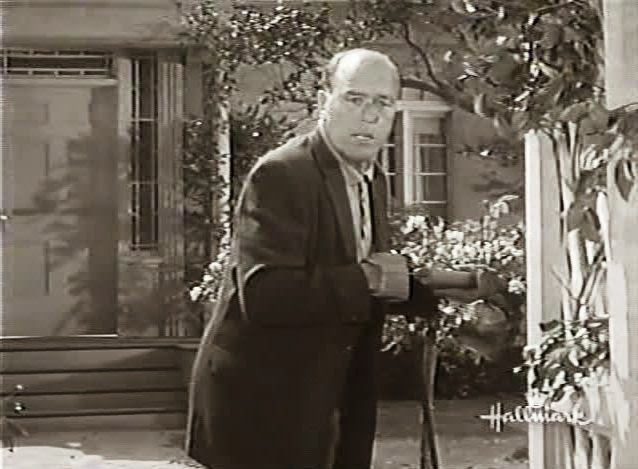 He was born Jacob Lincoln Freund and starred in Hitchcock's 1955 film, The Trouble With Harry. Forsythe's film career began in 1943 but he was best known for his many TV roles, starting in 1948 and including series such as Bachelor Father (1957-1962), Charlie's Angels (1976-1981) and Dynasty (1981-1989). In the rather small role of Michael's Friend, Jerry O'Hara, is Kent Smith (1907-1985), whose movie career began in 1936 and included such films as Cat People (1942) and The Curse of the Cat People (1944). 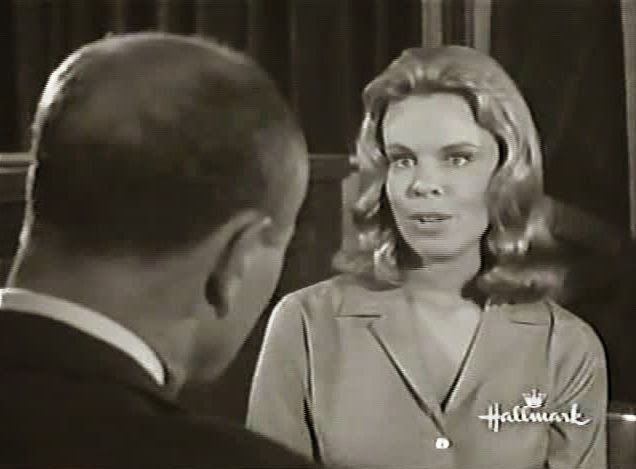 Smith was also in "A True Account" on Alfred Hitchcock Presents as well as two other hour-long shows. He was on The Outer Limits twice, Night Gallery twice, and he was a regular on Peyton Place (1964-1966) and The Invaders (1967-1968). Evans Evans (1936- ) played Penny, the girl who was waiting on the corner for George Peabody. Her TV career ran from 1958-1994 and she was on two episodes of the Hitchcock series and one of The Twilight Zone. She made a few movies and her best-known film role was in Bonnie and Clyde (1967). The year after "I Saw the Whole Thing" aired she married director John Frankenheimer and they remained married until his death in 2002. 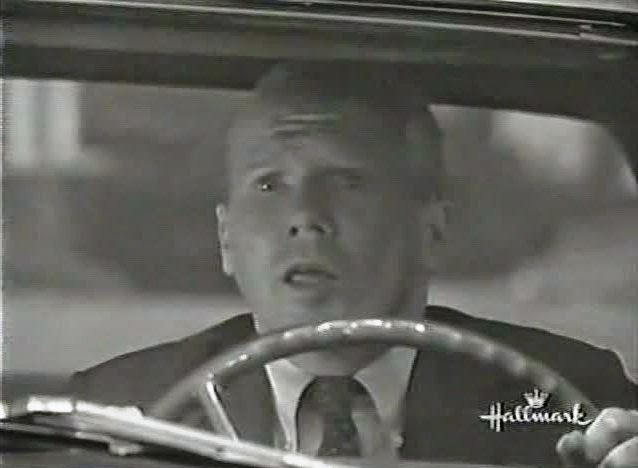 Another witness, Malcolm Stuart, was played by John Fiedler (1925-2005), who appeared three times on the Hitchcock series. All three episodes were penned by Henry Slesar: "The Last Remains," and "Incident in a Small Jail" were the other two. Philip Ober (1902-1982) played Col. Hoey. 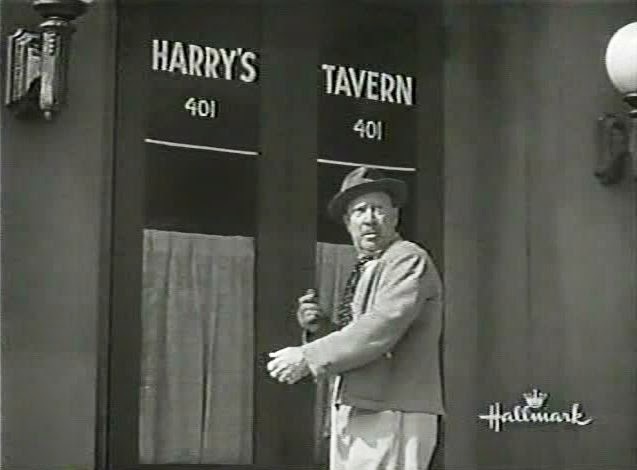 This was his second and last appearance on the Hitchcock show; his other one was also written by Slesar: "Burglar Proof." John Zaremba (1908-1986) played Richard Anderson, the prosecutor. He was in ten episodes of the Hitchcock series, including three by Slesar: "The Kind Waitress," "The Kerry Blue" and "Most Likely to Succeed." His large role in "I Saw the Whole Thing" was rather unusual for him, since he often played smaller parts. 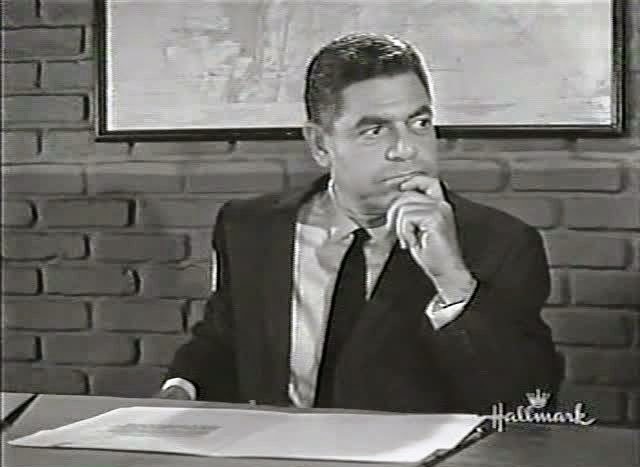 Lt. Sweet, who takes Barnes's statement at the police station, was played by Barney Phillips (1913-1982). Born Bernard Philip Ofner, he appeared thrice on the Hitchcock show and four times on The Twilight Zone. He will always be remembered as the counter man with the eye in his forehead in the Twilight Zone episode, "Will the Real Martian Please Stand Up?" 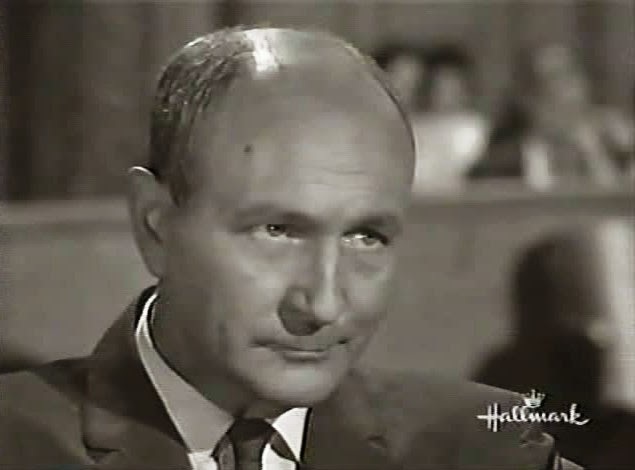 Rusty Lane (1899-1986) plays the first of two judges seen in this episode; he can be seen in nine episodes of the Hitchcock series, always in small parts. 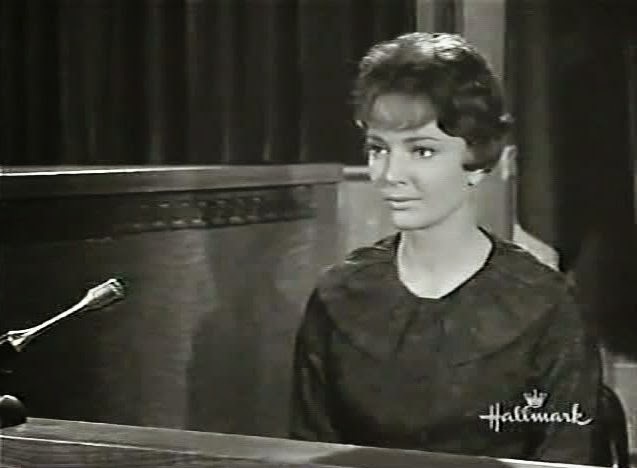 Finally, the role of Joanne Dowling, the last witness to take the stand, is played by Claire Griswold (1936-2011). 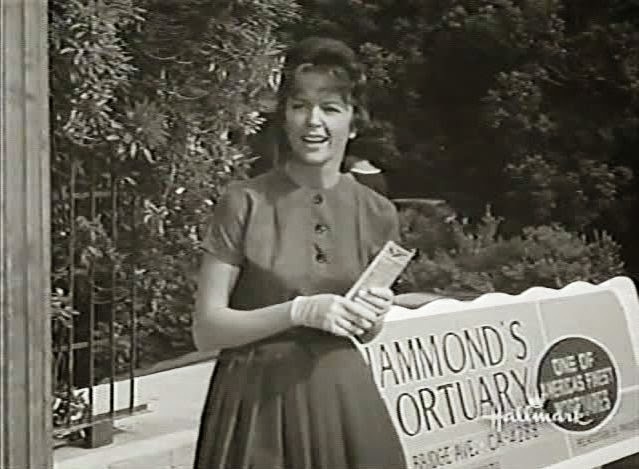 Her brief TV career ran from 1958 to 1967, though her last three appearances are on "I Saw the Whole Thing" in 1962, "A Home Away From Home" (The Alfred Hitchcock Hour, 1963), and an episode of Bonanza in 1967. She was on The Twilight Zone once as well. She was married to director Sydney Pollack from 1958 until his death in 2008 but, for Hitchcock fans, she is best known as one of the great director's female protegees. In 1962, he signed her to a seven-year contract, but she got pregnant in 1963 and the contract was terminated. She was more interested in raising a family than acting. "I Saw the Whole Thing" is an episode that becomes more interesting with study and with an understanding of the background of the people involved in its creation. Hitchcock filmed it in late July 1962, right after he finished filming The Birds and right before he would sit down (in August) with Francois Truffaut for his marathon interview that would become Truffaut's classic book. If anyone is interested in reading the radio play that Henry Cecil wrote in 1958, it is kept at McMaster University among Cecil's papers. They will scan it for about $30. "I Saw the Whole Thing" is not yet available on DVD or online. BBC Handbook-1959. Web. 22 Sept. 2014. <http://americanradiohistory.com/Archive-BBC-Annual/BBC-Year-Book-1959.pdf>. Cecil, Henry. Full Circle. Cornwall, UK: House of Stratus, 2013. Electronic. Cecil, Henry. Independent Witness. Chicago: Academy Chicago, 1989. Print. "Henry Cecil, McMaster Libraries." Henry Cecil, McMaster Libraries. Web. 22 Sept. 2014. <https://library.mcmaster.ca/archives/findaids/findaids/c/cecil.02.htm>. "I Saw the Whole Thing." The Alfred Hitchcock Hour. CBS. 11 Oct. 1962. Television. IMDb. IMDb.com. Web. 22 Sept. 2014. <http://www.imdb.com/>. "The Monday Play." Radio Plays Drama,bbc,, DIVERSITY Website. Web. 22 Sept. 2014. <http://www.suttonelms.org.uk/monday-play.html>. "New Publications." New Publications. Web. 22 Sept. 2014. <http://www.labyrinth.net.au/~muffin/publications_c.html>. "Radio Plays & Radio Drama." Radio Plays,Radio Drama Reviews,DIVERSITY WEBSITE, Audio Cleanup. Web. 22 Sept. 2014. <http://www.suttonelms.org.uk/RADIO1.HTML>. Spoto, Donald. The Dark Side of Genius: The Life of Alfred Hitchcock. London: Collins, 1983. Print. Wikipedia. Wikimedia Foundation. Web. 22 Sept. 2014. <http://www.wikipedia.org/>. *Antenna TV is now running two episodes of Alfred Hitchcock Presents every night! Check the schedule here. *ME TV is now running The Alfred Hitchcock Hour every Saturday night! Check the schedule here. *Coming in 2 weeks: "Final Vow" starring Carol Lynley and Clu Gulager. I sat down in my easy chair tonight and now I can say "I Saw the Whole Thing!" Without looking at the credits, you'd never know this bare bones affair was directed by Hitch. It's enjoyable enough but weak compared to other episodes right around it, in particular the Gig Young-Robert Redford masterpiece, "A Piece of the Action." The scene where the judge interrogates the chick on her way to put her kid up for adoption is bizarre in the extreme. The twist would later be ripped off by Scott Turow for PRESUMED INNOCENT. I think I'll hunt down the novel. Thanks, Peter! The novel is fun. I plan to get a copy of No Bail for the Judge and read it, too! Sorry that I can only read and not add as the only Hitchock I know and know well would be North By Northwest and Vertigo. Sorry if it seems like a commercial but I wanted to remind you guys of the best DC Comics site out there to talk Sgt. Rock or Batman or even oversee your own Hitchock or Twilight Zone discussion. There are a few Hitchcock mega fans there. Thanks, guys! Can you explain briefly how that site works? I've gone on before and I never can figure it out. Its simple. On the index page linked got to register and once you verify by email like any other service you can post on an existing thread by reply and if you wish to quote go to that option. You can also create your own threads. For example, you want to create an Alfred Hitchcock thread go to the Lounge section that is primarily for non-comic talk and use the button on the top left you to create your own topic. Its like most message boards. Not difficult at all. Its designed to mirror dccomic.com's former message board only with added in sections for other comic companies. Thanks! I'll give it a try. Something that nagged me but I forgot to mention was that this must have been the fastest arrest, arraignment and trial in human history. Didn't the wife drive the car to the hospital to have the kid at the beginning of the show and (at the end of the show) she's just had the kid as the hubby is found not guilty! Also, what kind of wife (besides Bonnie Bedelia, of course) would kick back and let her hubby take the rap for something she did? He could have faced a pretty pretty pretty long term of incarceration. It was a speedy trial but I think the wife was hospitalized for a dangerous pregnancy, not because she was on the verge of delivery. Also, they may not have made it clear enough in the TV show, but the husband made a big point of keeping the newspapers away from his wife so she did not even know he was on trial. He was worried that the surprise would endanger her health and the pregnancy and he also did not want her to spill the beans about who was driving. It sounds like a bad joke, but being a non-parent and a fan of motorcycles but not a car person, I have very mixed feelings about this story. And even though the story makes it clear that people immediately hurried up to the motorcyclist to help him BEFORE the driver left, in the back of my mind I keep thinking "hit and run driver," period. But it's always nice to see something with all these actors. I've never known many things with Evans Evans, but thanks to "Velma" in BONNIE AND CLYDE I've always liked her. Grant, you're right--it's definitely a hit and run. No one gets to the scene before the car takes off. Had they done so, they would have seen that it was a woman driving and the whole plot would've been ruined! The point is made more clearly in the novel that the accident was the fault of the motorcyclist, who was speeding and did not yield to the car, which was already in the intersection.